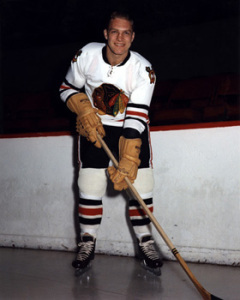 Whether anyone is a hockey history buff or not or even too young to remember this, one of the lesser known changes in the history of the game was something called the “banana blade.” Chicago Blackhawks star veteran Bobby Hull already changed the world of the sport but if he could be called an innovator, it would because of this. Of course players are always looking for little advantages to get ahead of the game and that’s what Hull did along with a little help from a teammate. He found a unique way to throw off goaltenders and with the skills he already had – like skating at almost lightning speed – he was almost unstoppable, and probably pretty scary to be around if he had the puck in his hands. It all started in the 1960s and there really isn’t too much account of how the banana blade actually came to existence. Apparently, Hull and fellow teammate and legend Stan Mikita were throwing out ideas on how to improve their shots. It was from there when they tried heating up the blade of a stick in water then placed it under a door and twisted it to a death-defying curve of almost three inches. No one, not even them being the experts, knew just how much of an uproar this seemingly little change would create in the NHL. The deep curve led to shots that were unpredictable and gave goaltenders nightmares. Back in the day, most goalies didn’t wear helmets so just think of the audience’s reaction to see slap shots happening in front of their eyes with this new invention. Okay, the crowd probably loved it but goalies, not so much if it meant getting a puck to the face. The blade was signed off as too dangerous and the league set the maximum curve for blades to one-half inch. The banana blade made shooting great, well, great if the player wasn’t in any danger. Slap shots were erratic and were sent off into every possible direction and at speeds that would even send fans sailing for cover. The problem with the blades was that they made passes and backhand shooting difficult. Of course Hull and his teammates loved them because of the advantage they gave for the shooters. Today, the blades are set to three-quarters of an inch, much to the benefit of everyone’s safety and teeth involved. The shots are much more controlled while passes and possession can be handled with closed eyes. If things ever go back to the way they were during the Hull and Mikita days – which is high doubtful – the NHL would have a field day just because of an experiment that happened decades ago by some of hockey’s biggest influences.